Hydraulic fracturing is a method of enhancing oil and gas recovery from wells by injecting water, sand, and chemicals into rock formations under very high pressure to fracture the rock and release trapped hydrocarbons. It has been used in the industry for decades, but questions have arisen concerning possible environmental problems associated with the practice, particularly suspected contamination of potable ground water and rivers and streams in certain areas. Currently the practice is regulated by the states, with rules varying from state to state. Some people, however, are asking for increased Federal regulation to govern its use (The Editors, 2011). This publication will discuss hydraulic fracturing, how it is used, how it is regulated, especially in Kansas, and possible environmental issues. Terms in boldface type are defined in the glossary at the end of the circular. 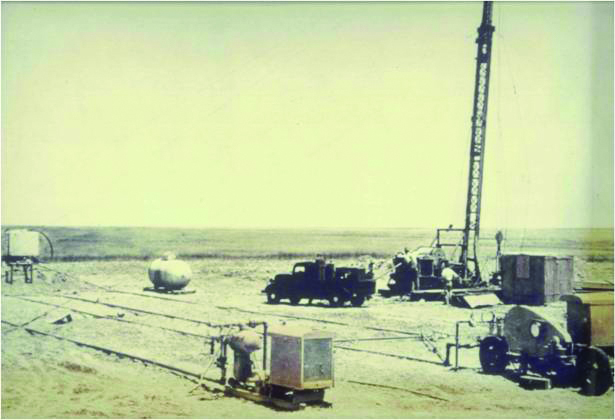 The first experimental hydraulic fracturing treatment in the United States took place in 1947 in the Hugoton gas field in Grant County, Kansas (fig. 1). It was done on a small scale to bypass pore space near the wellbore in the oil-bearing rock formation that was clogged by drilling mud during drilling operations (Montgomery and Smith, 2010). In 1949 a patent was issued to the Halliburton Oil Well Cementing Company, which then performed the first two commercial fracturing treatments in Oklahoma and Texas. At that time the engineering was simple and unsophisticated. Since then, significant advances have been made in materials and techniques, fracture modeling, fracturing fluids, and the types and amount of equipment needed (fig. 2). Today over 60% of all oil and gas wells drilled worldwide are fractured, with more than 50,000 fracture stages completed annually (Montgomery and Smith, 2010). In Kansas, over 57,000 wells have been hydraulically fractured since that first "frack job" in 1947 (KCC, 2011; fig. 3), and an estimated 90% of the wells drilled in Kansas over the next decade will be fractured (McCoy, 2011). Fracture stimulation has not only increased individual well production, sometimes manyfold, but also has increased estimated recoverable reserves of oil in the United States by 30% and gas reserves by 90% (Montgomery and Smith, 2010). Many oil and gas fields would not be economically viable without it. Figure 1--First experimental fracturing job conducted in 1947 by Stanolind Oil in the Hugoton gas field of southwestern Kansas utilizing "1,000 gallons of naphthenic-acid and palm-oil- (napalm-) thickened gasoline" ... "and sand from the Arkansas River" (from Montgomery and Smith, 2010, p. 2). 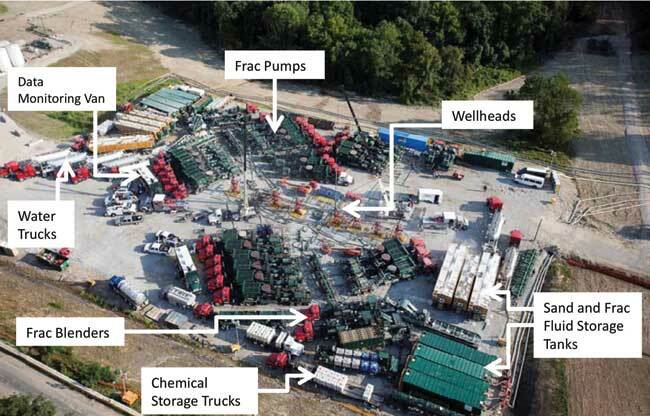 Figure 2--A very large, staged hydraulic fracturing job performed recently on a Marcellus Shale multi-well pad in Pennsylvania (modified from U.S. DOE and NETL, 2011, p. 6). Large numbers of trucks and equipment and voluminous quantities of fracturing fluids are needed to carry out an operation such as this. Fracking operations in Kansas normally are not done on such a large scale. 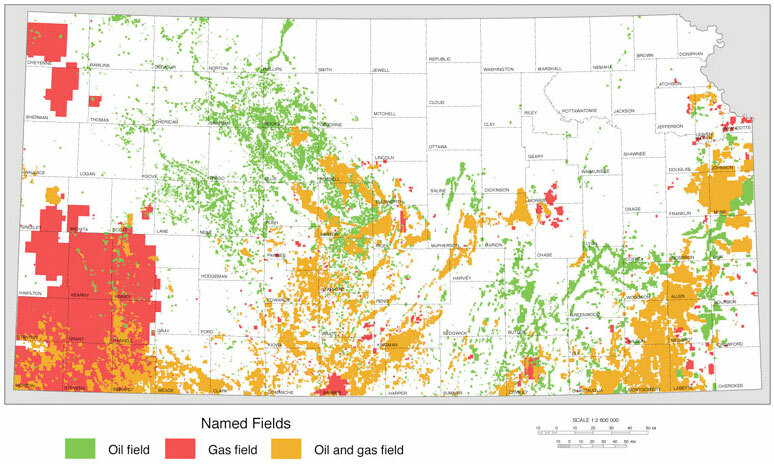 Figure 3--Over 430,000 oil and gas wells have been drilled in Kansas since the late 1800s. Of the roughly 244,000 wells drilled since 1947, over 57,000 of those wells have been hydraulically fractured. Alongside advancements in hydraulic fracturing, horizontal drilling has become increasingly important in the past decade or so. In contrast to conventional vertical drilling, horizontal drilling begins vertically, then, at a given depth, turns gradually in a horizontal direction, in which the borehole proceeds for a long distance through a single formation. Coupling hydraulic fracturing with horizontal drilling has been instrumental in turning previously uneconomical and unconventional plays, such as shale gas (fig. 4), tight gas sandstone, and coalbed methane, into highly productive projects. A fundamental consequence of this recent coupling is that the scale of hydraulic fracturing operations has increased immensely in the last few years (fig. 2). Figure 4--Major shale gas plays in the contiguous United States (from EPA, 2011, p. 10). Hydraulic fracturing, also known as hydrofracturing, hydro-fracking, fracking, or fracing, enhances the recovery of oil and gas from wells by fracturing formation rocks to release the hydrocarbons, allowing them to flow more easily through the rocks to the wellbore. Not all formations require such supplementary well completion techniques to permit extraction of hydrocarbons. Some rocks naturally contain abundant fractures and connected pore space that, although often only a millimeter or less across, allow fluids to move freely through them. Other rock formations, such as many shale gas reservoirs, are not permeable (i.e., the pores are not connected) and have few natural fractures and visible pore space. Gas or oil trapped within such impermeable rock can only be extracted by fracturing the rocks. Hydraulic fracturing is performed soon after a well has been drilled and the metal well casing has been cemented into place by filling the annular space around the casing with cement. Selected segments of the wellbore are isolated, and specialized equipment is used to perforate holes through the production casing and cement of each segment. Water containing sand and chemical agents is then pumped at very high pressures, typically thousands of pounds per square inch, through the perforations into the surrounding rock. The intense pressure exerted by the water cracks the rock, creating minute fractures that propagate sometimes hundreds of feet away from the wellbore (fig. 5). Fracturing jobs are normally engineered to restrict the fractures to the target formation. The sand in the fracturing fluid, usually silica sand, is added as a "proppant"; that is, the fractures are propped open by the sand grains after the pressure is released. Although the fractures are held open only the width of a sand grain, it is enough to allow hydrocarbons trapped in the rocks to flow to the wellbore. Some wells are hydrofractured in more than one producing horizon, depending on where oil and gas occur in the subsurface. Figure 5--Hydraulic fracturing in a vertical well (modified from EPA, 2011, p. 13). Prior to the last decade, hydraulic fracturing was used primarily in vertical wellbores and in "conventional" rocks such as limestone and sandstone to stimulate oil and gas production (fig. 5). In recent years, operators have begun drilling more horizontal wells because they maximize the contact area within the targeted formation (fig. 6). Horizontal drilling has become especially useful in unconventional gas plays, such as tight gas sandstones, gas shales, and coalbed methane. In such operations, the horizontal part of a well can extend for 1,000 to 5,000 feet or more through a single rock formation. After the well casing and cement are installed in the well, perforations are made at several locations along that horizontal reach. Hydraulic fracture stimulation is then performed at those locations in stages, beginning at the far end and moving closer to the uphole end with each stage of the stimulation (fig. 6). This controlled procedure allows the operator to adjust for site-specific changes along the wellbore. For example, variations may occur in formation thickness, the integrity of the rock, the presence or absence of natural fractures, proximity to other wellbore fracture systems, and boreholes not centered in the formation at some points. Formation-specific data collected along the wellbore can be used to optimize the fracture patterns created. Strong economic incentives compel operators to avoid propagating fractures beyond the target formation and into adjacent strata (Ground Water Protection Council and ALL Consulting, 2009). Besides constituting a waste of time, materials, and money, fracturing outside the targeted formation could result in loss of the well or in excess water encroachment from surrounding strata, which increases production costs. Before a fracturing operation commences, sophisticated computer models are used to design the process based on known characteristics of the rocks and fractures in the formation, and to "evaluate the height, length, and orientation of potential fracture development" (Ground Water Protection Council and ALL Consulting, 2009, p. 57). Tests are run on the well casings, cement, and fracturing equipment before and during the entire operation to assure that the well and equipment are working properly and safely. Technologies such as microseismic fracture mapping and fracture tilt measurements are used to evaluate the success and orientation of the fractures created. Fluids used for hydraulic fracturing consist primarily of water and a proppant (usually sand), with various additives that serve different purposes (table 1). Water and sand make up 98% or more of the fluid, while the additives constitute 2% or less (FracFocus.org, 2011). The additives used vary according to site-specific characteristics of the well, the target formation(s), the water source, and individual company practices. Some companies keep the compositions of their frack fluids confidential for proprietary reasons, or simply list all the ingredients and keep their relative percentages confidential, whereas other companies disclose the exact composition of their frack fluids. Companies can voluntarily disclose the chemical additives they use for hydraulic fracturing on the web-based registry, www.hydraulicfracturingdisclosure.org/fracfocusfind/. Although in most cases only a limited number of additives are used in any one well treatment, the 2011 Environmental Protection Agency (EPA) Hydraulic Fracturing Study Plan (EPA, 2011) lists nearly 1,000 chemicals that have been identified in various frack fluids and flowback/produced waters. A separate table in that document lists 30 naturally occurring substances that may be leached from the rocks by fracking activities, including radium, thorium, uranium, arsenic, hydrogen sulfide, and lead. Table 1--Example of volumetric composition of typical hydraulic fracturing fluid (from EPA, 2011, p. 29). In a typical fluid mixture, friction-reducing additives (called slickwater), often consisting of petroleum distillates or soap-like agents called surfactants, are used to facilitate pumping of the fluids and proppant at a higher rate and at lower pressures than if water alone were used (Ground Water Protection Council and ALL Consulting, 2009). Thickening agents, such as guar gum (also used as a thickener in food, toothpaste, and cosmetics), help suspend the proppant. Biocides eliminate bacteria that can cause biofouling of the fractures, corrosion of the pipes, or creation of unwanted byproducts such as poisonous H2S gas. Other stabilizing agents help prevent metal corrosion, and acids clear pore space clogged near the borehole by drilling mud. According to the Ground Water Protection Council and ALL Consulting (2009, p. ES-4), "the drilling and hydraulic fracturing of a horizontal shale-gas well may typically require 2 to 4 million gallons of water." Some may require more. This is a one-time use, and the amounts are relatively small in comparison to, say, the amount of water used for irrigation. An average agricultural irrigation well in western Kansas, irrigating approximately 125 acres, pumps nearly 45 million gallons of water per year (calculated from 1998 water usage figures given in Rogers and Wilson, 2000). Hydraulic fracturing requirements vary from well to well, and as technologies and methods improve over time, the amount of water needed appears to be decreasing. The water used for hydraulic fracturing typically comes from local sources, such as rivers and lakes, ground water, municipal supplies, recycled flowback water from other frack jobs, and re-used water produced from the oil and gas formation. In areas where water supplies are limited, obtaining water can present a challenge. In Kansas, the Division of Water Resources, which governs how water is allocated and used in the state, issues permits to operators who pump water for industrial purposes such as fracking. When a fracking treatment is completed and the pressure is relieved, the fracturing fluid, mixed with natural formation water, begins to flow back up the casing to the surface, where it is emptied into tanks or pits for later disposal. This water, which can vary from fresh to saline, contains compounds from the fracturing fluid, formation waters, and dissolved components from the rocks. A large portion of the fracturing fluid is recovered within a few hours to a couple of weeks, but much of the frack material stays in the ground until it is pumped to the surface with the produced hydrocarbons, and some may stay in the deep subsurface permanently. 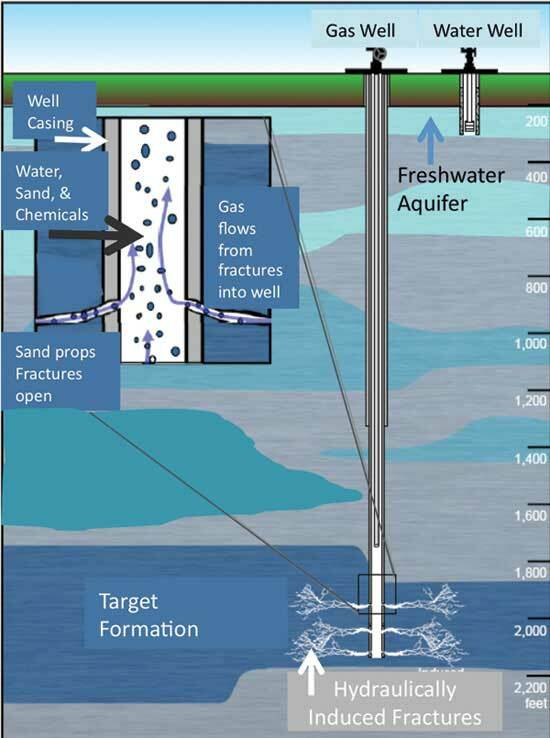 The Ground Water Protection Council and ALL Consulting (2009) state that "the volume of produced water may account for less than 30% to more than 70% of the original fracture fluid volume," and "in some cases, flowback of fracturing fluid in produced water can continue for several months after [oil and/or] gas production has begun." This water must be managed or disposed of properly. In Kansas, the Kansas Corporation Commission (KCC) regulates management of the storage pits and tanks, and the ultimate disposal of fracking fluids and produced water. Fracturing fluids can sometimes be re-used for the same purpose in another well, but oftentimes they are injected into deep disposal wells, which also are regulated by the KCC. In the majority of cases in Kansas, formations targeted for oil and gas production lie thousands of feet beneath the surface of the earth, whereas ground-water aquifers used for drinking water and irrigation lie within a few hundred feet of the surface (fig. 6). The drinking-water aquifer is therefore separated from the oil or gas reservoir by thousands of feet of impermeable rock and is thus protected from contamination by oil or gas. 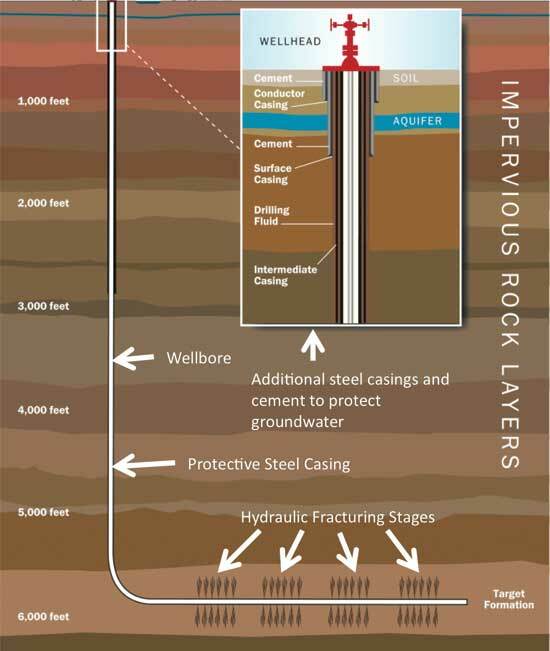 When hydraulic fracturing is applied to a formation, care is taken to confine fracturing to the targeted formation. With the additional safeguard of thousands of feet of overlying rock in most drilling situations, it is highly unlikely that fractures will propagate far enough through the rock to reach overlying aquifers. The metal well casing installed in the borehole and the cement that seals the annular space around the casing (fig. 6) confine the fracking fluids and any produced hydrocarbons and other formation fluids within the casing and prevent them from entering surrounding formations. KCC regulations require that additional casings be installed through freshwater aquifers to add extra protection against ground-water contamination. In some areas of Kansas, hydrocarbon reservoirs, especially gas reservoirs, lie closer to the surface and thus extra vigilance is required to reduce the risk of ground-water contamination. Additionally, with the advent of horizontal drilling, the risk of encountering natural faults or fractures that extend into overlying layers increases with the increasing horizontal lengths of the boreholes. Special precautions must be taken not only to assure good casing and cement installations, but also to employ good engineering and rock characterization to avoid natural faults that may be conductive to overlying aquifers, and to confine hydraulic fracturing to the target formation. In some areas where drilling occurred very early in the history of the oil and gas industry in Kansas, undocumented unplugged wells may still be present. These wells were drilled before serious oversight commenced, or before anyone truly understood many of the relevant stratigraphic and structural geologic principles. The KCC is plugging abandoned wells as it becomes aware of them and as the budget allows. Many of the additives in fracking fluids are generally safe (water, sand, certain acids, etc. ), but some additives and formation flowback chemical solutions (benzene, toluene, radium, saline waters, etc.) are less safe and need to be managed properly. Oil and gas statutes developed by the Kansas Legislature and regulations developed by the KCC serve to govern hydraulic fracturing in oil and gas wells and the subsequent management of fluids and chemicals. The KCC, as the regulatory agency, approves, oversees, and inspects such operations, and no ground-water contamination has been reported to them as a consequence of fracking operations in Kansas. Additionally, since the method was pioneered in Grant County in 1947, technologies and treatments have evolved and become more precise, controlled, and safe. Other states have experienced concerns with fracking or with disposal of the resulting fluids. Questions have been raised about possible contamination of local water wells by natural gas or by fracking fluids in Pennsylvania, Colorado, Wyoming, and Texas, among others (Biello, 2010; Earthjustice, 2011; Lustgarten and ProPublica, 2011). A well blowout in Pennsylvania resulted in fracking fluids spilling onto the ground and flowing across fields and into streams (WNEP, 2011). Also in Pennsylvania, where few deep injection wells are available for disposal, fracking fluids have been taken to local wastewater-treatment plants, which are ill-prepared to deal with the huge volumes of additional wastewater and the types of contaminants found in them (The New York Times, 2011). As a result, high levels of undesirable contaminants, such as radium, benzene, toluene, trihalomethanes, and highly saline water have been released into major streams that supply drinking water for millions of people. In addition, methane, known to be a powerful greenhouse gas, is sometimes released into ground water or into the atmosphere due to improperly cased wells or leaking pipes (Food & Water Watch, 2011). Other airborne pollutants found at higher than allowable limits near fracking sites in Texas and Wyoming include methanol, formaldehyde, carbon disulfide, benzene, and other neurotoxins and carcinogens, as well as volatile organic compounds that can react with sunlight to create smog (Biello, 2010; Food & Water Watch, 2011). Concerns about induced seismicity, or earthquake activity related to injection of fluids into the subsurface, have been raised in some areas, but there is no evidence that hydraulic fracturing itself triggers earthquakes. Instead, small earthquakes may have been triggered by deep disposal of fluids from oil and gas operations (Zoback, 2012). Some of these incidents may have resulted from fracking in unfamiliar formations or geologic situations, or perhaps due to unsuspected faults, unplugged abandoned wells, or other unexpected fluid migration routes. Inadequate means of dealing with the volumes of fluid generated can be a problem, as in Pennsylvania. In some cases, the problems may not be directly related to hydraulic fracturing itself, but rather to operating issues such as casing problems, or broken pit liners or mud tanks (Durham, 2011). Clearly, experience, good engineering, and good regulatory oversight are important for the successful management of hydraulic fracturing treatments. For the most part, Kansas has not encountered the problems some other states have, and no documented cases of ground-water contamination by hydraulic fracturing have been reported in the state. Hydraulic fracturing has been employed for over 60 years in Kansas, in most cases hundreds or thousands of feet beneath any usable aquifers, thus posing little threat to them. Casing, cementing, and plugging regulations secure the safety and integrity of the wells when carried out properly. Deep disposal wells are available throughout much of the state, and they have been regulated and overseen by the KCC and Kansas Department of Health and Environment for many years; consequently, in Kansas, fracking fluids are not disposed of in wastewater-treatment plants. In short, Kansas' favorable geologic setting, its regulatory process, and its successful history of hydraulic fracturing and fluid management make it one of the safer regions of the country to employ the practice. Bates, R. L., and Jackson, J. A., 1980, Glossary of geology, 2nd ed. : American Geological Institute, 751 p.
Biello, David, 2010, What the frack? Natural gas from subterranean shale promises U.S. energy independence--with environmental costs: Scientific American, March 30, 2010, http://www.scientificamerican.com/article.cfm?id=shale-gas-and-hydraulic-fracturing (accessed November 2011). Durham, L. S., 2011, Study seeks to inject science into frack debate: American Association of Petroleum Geologists, AAPG Explorer, July 2011, http://www.aapg.org/explorer/2011/07jul/ut_frack0711.cfm?zbrandid (accessed July 2011). Earthjustice, 2011, Fracking across the United States: Earthjustice, http://earthjustice.org/features/campaigns/fracking-across-the-united-states (accessed June 2011). The Editors, 2011, Safety first, fracking second: Scientific American, October 19, 2011, http://www.scientificamerican.com/article.cfm?id=safety-first-fracking-second (accessed November 2011). EPA, 2011, Plan to study the potential impacts of hydraulic fracturing on drinking water resources: Office of Research and Development, U. S. Environmental Protection Agency, Washington, D.C., November 2011, EPA/600/R-11/122, http://water.epa.gov/type/groundwater/uic/class2/hydraulicfracturing/upload/hf_study_plan_110211_final_508.pdf (accessed November 2011). Food & Water Watch, 2011, The case for a ban on gas fracking: Food & Water Watch, June 2011, 15 p., http://www.foodandwaterwatch.org/tools-and-resources/the-case-for-a-ban-on-gas-fracking/ (accessed June 2011). FracFocus.org, 2011, Hydraulic fracturing--The process: FracFocus, http://fracfocus.org/hydraulic-fracturing-how-it-works/hydraulic-fracturing-process (accessed November 2011). Ground Water Protection Council and ALL Consulting, 2009, Modern shale gas development in the United States--A primer: U.S. Department of Energy, Office of Fossil Energy, and National Energy Technology Laboratory, 96 p., http://www.netl.doe.gov/File%20Library/Research/Oil-Gas/Shale_Gas_Primer_2009.pdf (accessed April 2014). KCC, 2011, Kansas Corporation Commission, Conservation Division, web page: Kansas Corporation Commission, http://www.kcc.state.ks.us/conservation/index.htm (accessed May 2011). Lustgarten, Abrahm, and ProPublica, 2011, EPA finds fracking compound in Wyoming aquifer: Scientific American, November 10, 2011, http://www.scientificamerican.com/article.cfm/id=epa-finds-fracking-compound-wyoming-aquifer (accessed November 2011). McCoy, Daniel, 2011, Kansas oil and gas industry working to educate about hydraulic fracturing: Wichita Business Journal, February 18, 2011, http://www.bizjournals.com/wichita/print-edition/2011/02/18/kansas-oil-and-gas-industry-working-to.html?page=all (accessed November 2011). Montgomery, C. T., and Smith, M. B., 2010, Hydraulic fracturing--History of an enduring technology: Society of Petroleum Engineers, JPTOnline, http://www.jptonline.org/index.php?id=481&searched=hydraulic+fracturing&advsearch=oneword&highlight=ajaxSearch_highlight+ajaxSearch_highlight1+ajaxSearch_highlight2 (accessed June 2011). The New York Times, 2011, Regulation lax as gas wells' tainted water hits rivers: The New York Times, February 26, 2011, http://nytimes.com/2011/02/27/us/27gas.html_r=1&sq=hydrofracking&st=cse&scp (accessed March 2011). Rogers, D., and Wilson, B. B., 2000, Kansas irrigation systems and cropping trends: Kansas Geological Survey, High Plains Atlas: http://www.kgs.ku.edu/HighPlains/atlas/atisct.htm (accessed August 2011). U.S. DOE and NETL, 2011, Shale gas--Applying technology to solve America's energy challenges: U.S. Department of Energy and National Energy Technology Laboratory, March 2011, http://www.netl.doe.gov/file%20library/research/oil-gas/Shale_Gas_March_2011.pdf (accessed April 2014). WNEP, 2011, Gas drilling emergency in Bradford County: WNEP, Channel 16, Moosic, PA, April 20, 2011, http://www.wnep.com/wnep-brad-leroy-gas-drilling emergency20110420,0,1884646.story (accessed June 2011). Zoback, M. D., 2012, Managing the seismic risk posed by wastewarter disposal: Earth, The Science Behind the Headlines, April 17, 2012, http://www.earthmagazine.org/article/managing-seismic-risk-posed-wastewater-disposal (accessed April 2012). Aquifer: a geologic formation or body of rock that is porous and permeable enough to transmit ground water at a rate sufficient to yield significant quantities of water to wells or springs. Coalbed methane: natural gas (primarily methane) produced from coal beds; the methane is adsorbed into the solid matrix of the coal, and the coal must be fractured and dewatered to release the gas. Drilling mud: a mixture of mud-like substances used to lubricate the drill bit and drill stem when drilling an oil or gas well. Fracture stages: each of the individual hydraulic fracturing operations carried out at different levels or locations within a single oil or gas well. 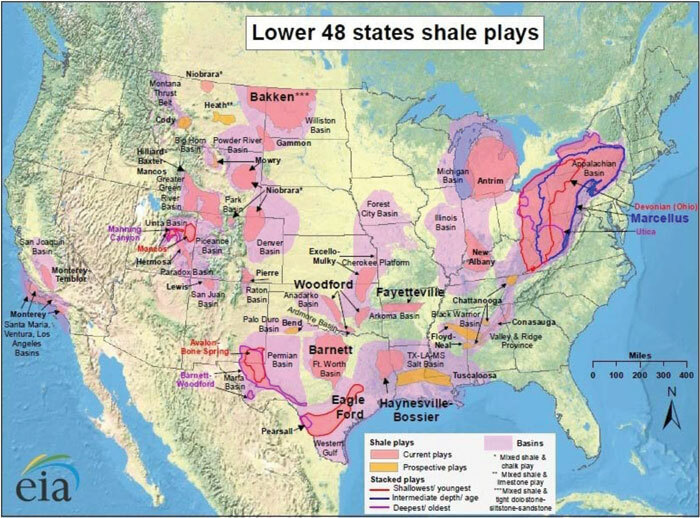 Shale gas: natural gas produced from shale, usually trapped in tiny unconnected pore spaces in impermeable shale that requires fracturing of the rock to release the gas. Tight gas sandstone: sandstone that contains natural gas trapped in small unconnected pore spaces; needs fracturing to release the gas. Well casing: "Heavy metal pipe, lowered into a bore hole during or after drilling and cemented into place. It prevents the sides of the hole from caving, prevents loss of drilling mud or other fluids into porous formations, and prevents unwanted fluids from entering the hole" (Bates and Jackson, 1980, p. 97). The types of casing permitted in Kansas are discussed in KCC regulations online (KCC, 2011).